As part of our filming and outreach program we are co-producing a film with the Smithsonian Channel on the research of fisheries biologist Daniel Pauly. He and his team, based at the University of British Columbia, have been working on catch reconstructions, a massive data project to calculate the real quantity of fish we catch around the world. 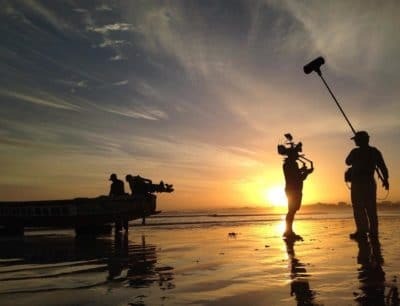 The last film shoot for this project took us to Dakar in Senegal. Filming Dr. Daniel Pauly discussing Senegal’s reconstructed fish catch with Dr. Dhyia Belhabib, a fisheries scientist at the University of British Columbia. 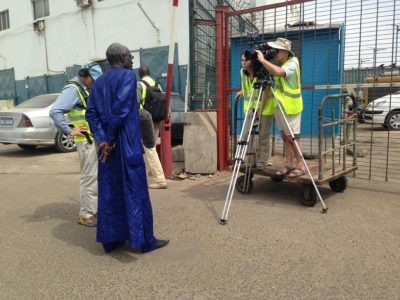 On our first day’s filming in Senegal we went to the Port of Dakar, one of the busiest fishing ports in West Africa. We had gone to see what a commercial export fishery looks like and met with Adama Lam, the Director General of SOPASEN, (Société de Pêche et dArmement Sénégalais). We talked with him about the fishing industry in Senegal and he granted us access to the boats and warehouses of the fishery. We watched box after box of frozen fish being offloaded from one of the boats that had recently come back to port. The fish was caught, frozen, and packed in boxes at sea, each box weighed roughly 40lbs and there seemed to be hundreds of them. These fish are destined for export. It is estimated that each year the European market absorbs about two thirds of fish exports from Senegal. Keeping these fish cold is vitally important and as soon as the boxes were off the boat they were transported directly to a freezer warehouse. The warehouse was one of several within the port and it was extremely cold, we were told it was -22C. Inside revealed thousands upon thousands of pounds of frozen fish and we got a sense of the scale of commercial fish exports. One of the major problems facing Senegalese fisheries is that many high value fish stocks, usually fished for export, are fully or even over exploited. 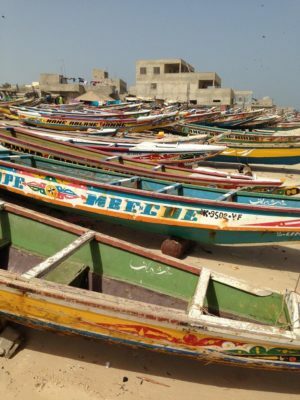 Reports state that the fishing sector employs about 100,000 people in Senegal and that fishing agreements with other countries greatly contribute to government revenue. Fish is a major source of protein for the people of Senegal and in addition to the commercial export fishery there is a huge small-scale fishery. 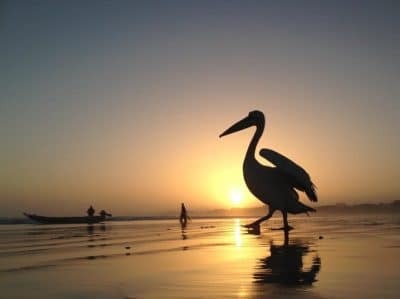 Our second day’s filming was a complete contrast to the Port of Dakar as this time we went to the beach at Yoff where many small pirogues set off at dawn. As the sun rose the beach became a flurry of activity. 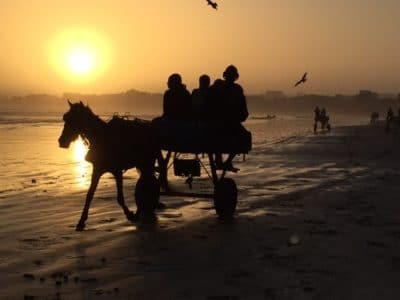 Small pony carts brought outboard motors up and down the beach to be strapped on the back of the pirogues. These beautiful boats were crewed by local fishermen who would roll the boats down to the water before heading out into the waves. The fishing trips lasted several hours and the men would haul in their catch by hand. Once they returned to shore later in the afternoon the fish was destined for the local markets of Dakar and the immediate surroundings, as well as for personal consumption. There are thousands of pirogues in Senegal fishing up and down the coastline from Dakar. As fish stocks decline there is a serious risk of local market shortages, and shortages of fish that head from Senegal into the Interior of Africa.